One last design with the Coffee Cafe bundle! This card doubles as a gift card holder, perfect for those hard-to-buy for people. Thanks to Erica Cerwin for this one. It's very easy to make - the woodgrain background is actually a piece of designer series paper from the Coffee Break pack. This makes for a quick and easy card. Just change up the colours to suit the recipient. 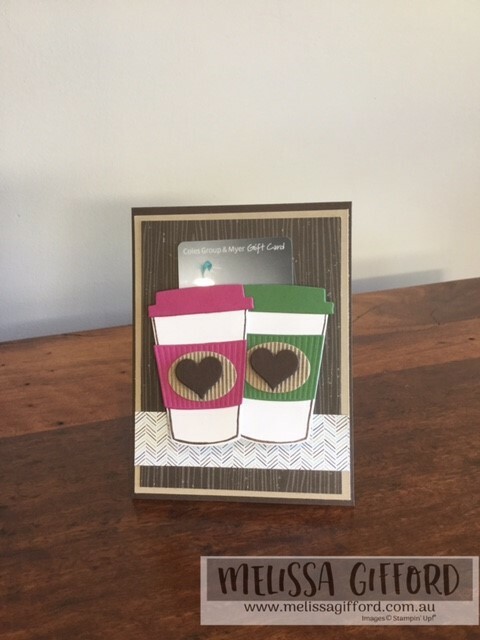 Using the foam strips creates a pocket on the back of the two coffee cups for a gift card to slide into.